Alix Sorrel’s journey to becoming a board certified Orthopedic Physical Therapy Specialist and opening her own practice began with a simple desire that blossomed into a passion: to help people take the steps necessary to make their body a complete, whole and fully integrated unit. “I want people to learn how to move in a way that their body works for them rather than against them,” she says earnestly. At a young age, Alix was profoundly moved when she attended physical therapy for a sports injury. Changed by what she experienced, Alix recognized her life’s mission, and set out to fulfill her passion. She graduated with a Bachelors Degree in Kinesiology/ Human Movement from Louisiana State University in 2006, and after deciding to take her education to the highest level earned a Doctorate in Physical Therapy at the University of Saint Augustine in 2008. She continued to further her education and expertise by obtaining a Board Certified Orthopedic Physical Therapy Specialist. Today, Alix is living her dream. She opened Integrated Physical Therapy in 2012, fulfilling the mission she set for herself many years ago…allowing her to integrate Pilates Rehabilitation into her physical therapy practice. “I enjoy providing one on one Physical Therapy Treatment and Pilates wellness services to my clients,” she says proudly. Alix is an advanced teacher and mentor with Polestar Pilates Education and a certified Pilates Instructor through the Pilates Method Alliance. “In January 2013 we expanded the practice by adding a fully equipped Pilates studio with qualified Pilates instructors providing Pilates Instruction,” Alix says. This expansion allows patients discharged from physical therapy to continue with Pilates wellness classes – taking them on their way to wholeness and wellness. Also keeping her busy are the pride and joys of her life, her 6 year old daughter Emma and her 3 year old son Carter. At Integrated Physical Therapy, Alix’s unique approach to physical therapy and nurturing personality will lead you on the path to experiencing your body behaving in the optimal the way it was designed. Call to make an appointment or stop in today! Enjoying learning and seeing the many ways that people move their body has always been a love of Charley’s! She has competitively danced for the past 16 years, and has been an dance instructor for over 4 years now. Incorporating Pilates into dance has helped her and her students develop and grow. For the past 2 years, she has enthusiastically taught Pilates. Her love for practicing Pilates has brought about a better understanding of her clients and their bodies! As a future December graduate of ULL Business Management, balancing 18 hours of school (with a 3.6 gpa), dancing 3 to 4 nights a week, and teaching and practicing Pilates – Charley is definitely a geaux getter and over achiever! Born and raised in Sulphur, Louisiana, Katie moved to the “big city” of Lafayette when she was 12 in 2005. During middle school, she played travel soccer and at the age of 15, she was introduced to Pilates by her Mom. Throughout high school and college, she competed in kettle-bell competitions along with other sports, primarily soccer. Pilates helped aid her athletics. In 2016, Katie graduated from UL with a Bachelors in English and was a member of the Phi Kappa Phi National Honors Program. She taught English class to middle and high school students in Acadiana. 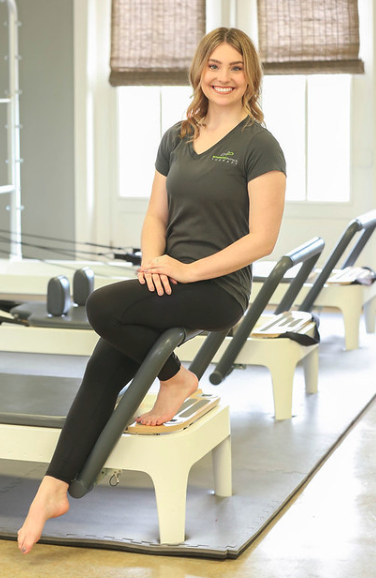 Although she enjoyed teaching, her love for Pilates never diminished and she became an instructor in 2018 after graduating from the Polestar Pilates program. Not only does she have a passion for health and the benefits of natural, organic, hormone-free Whole Foods, but she also lives by what she loves. She helped her Dad build a vegetable garden, which nestles on a quarter of an acre piece of land, and she recently purchased a few chickens to eat fresh eggs daily. Katie is a true testament of living by what you love! Integrated Physical Therapy, LLC provides a distinctive combination of physical therapy, pilates, and manual therapy in Lafayette, LA.